Super Comrades crowned with South African Winner! On this past weekend much of the sporting debate centred around 2 things. The somewhat surprising squad selected by Heyneke Meyer and the abysmal performance by the national football side Bafana Bafana in the World Cup Qualifiers. But arguably the biggest sporting event in South Africa this week end was the ultimate marathon known as the Comrades Marathon. Now as big fans of Zimbabwean runner Stephen Muzhingi, we were watching the race with a desperate hope to see him win. Of course should Stephen miss out on the win, we would want a South African to take the race. The race was fantastic with Gert Thys pushing through the barriers to lead at the half way stage. Unfortunately it looked like that was it for him as he turned out with some struggle and eventually was unable to finish the race. Blisters seemed to derail Stephen in his quest to win his fourth straight Comrades and it then emerged that Mr Price Sport runner Ludwick Mamabolo was ready to take on the reins. Ludwick became the first South African in Seven years to win the Comrades Marathon. 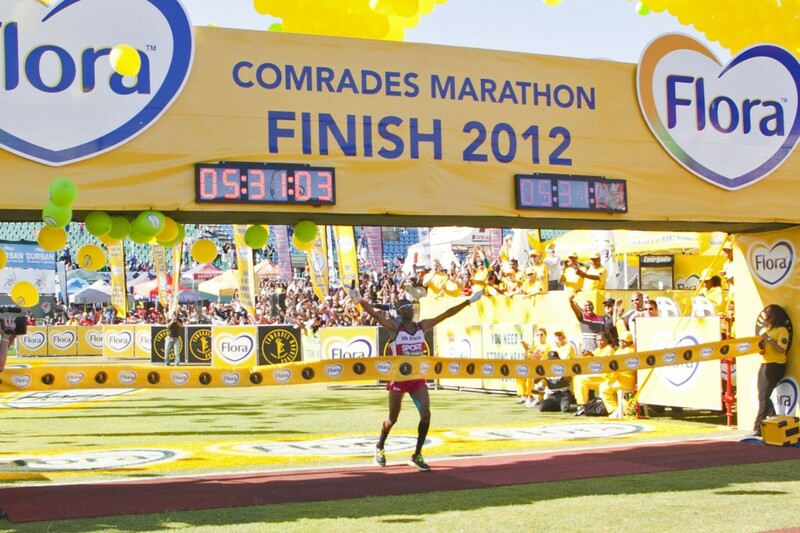 After securing his victory in a sensational time of 5:31:03, Mamabolo said it had been an absolute dream come true. “I am just very grateful to be the first South African in seven years to win and I just want to thank all the supporters and the team from Mr Price,” he said afterwards. The 35-year-old ran a superbly timed race, seeing off a number of challengers to take an outright lead with 22 kilometres to go, and from there he never looked back.Behind him, places changed hands as runners jostled for a podium finish, with teammate Bongmusa Mthembu finishing strong to clinch second spot (5:32:40). In the women’s race, Elena Nurgalieva (another of Mr Price SPORT) secured an incredible seventh Comrades title in what was her fastest time – 6:07:12. Running without her sister Olesya, who has recently given birth, Elena surged into an unassailable lead with 20-odd km’s to go, while teammate Marina Zhalybina (formerly Bychkova) marked her return to Comrades by securing an 11th gold medal in third place. Of course the race will also hold fond memories for the team from the Unogwaja Challenge, John McInroy founder of Red Sock Friday, Dr WP van Zyl, Lourens van Zyl, Paul Blake and Miranda Symons. They took the incredible journey to cycle from Cape Town to Pietermartizburg and then completed the incredible Comrades marathon too. Follow them on Twitter here and see what they have planned for the 2013 Unogwaja Challenge. Its ShoOops!!! 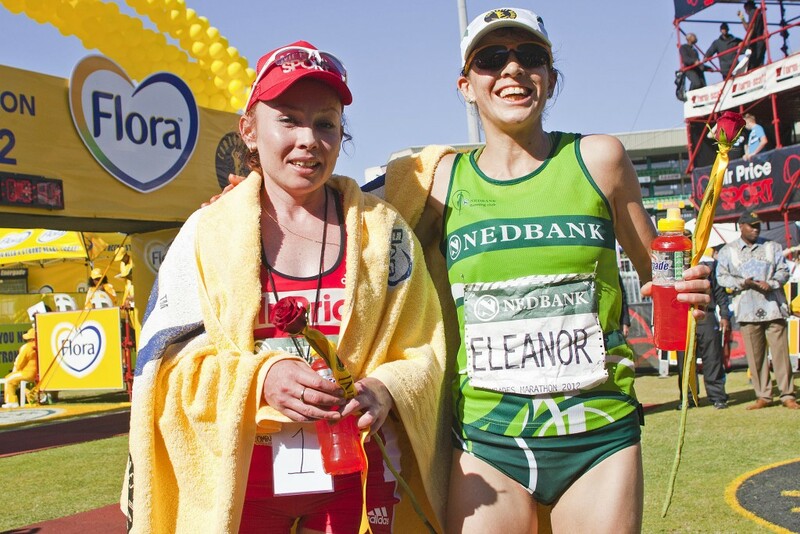 Also completing the race for the first time was Zola Budd who finished hand in hand with mentor Bruce Fordyce. It was Budd’s firsts after years of being a sporting icon with Fordyce finishing his 30th. Other celebrities that took part were Vuyo Mduli and Radio Personalities Koula and Brad Brown. 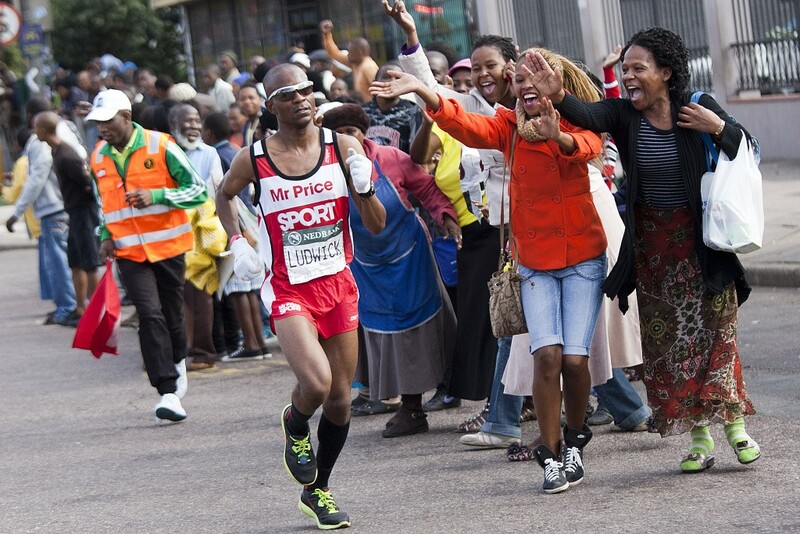 Derrick Msibi who was running to raise funds to send two kids through school finished successfully for the 12th time. Of course there were thousands of others that finished and the achievement is incredible for each and every one of them! All images are exclusively supplied by Mr Price SPORT and photgrapher Pierre Tostee, All Things Jabu has obtained full permission for use of the images.